Easter is fast approaching and, as well all know, the theme on everyone’s mind will be one thing and one thing alone – chocolate eggs! At Kinder Surprise World, eggs are our specialty, so we thought we’d share these extra special eggs with you. Arriving just in time for the big day, these Kinder Surprise DC Super Maxi eggs are the hottest commodity on the chocolate egg market this Easter. Stay ahead of the trend and act fast with these limited edition eggs from Kinder, featuring a special DC Comics theme. Each of these awesome eggs contains a classic surprise inside, with a large superhero toy to be discovered inside all that delicious chocolate. While you’ll be the superhero that delivers your little one a luscious creamy chocolate egg this Easter, they’ll also be able to play along with their favourite superhero hidden inside the egg. With a range that includes eggs for boy and eggs for girls, they’ll be no complaining as they get to discover one of these awesome DC Comics superheroes while they eat their tasty Kinder Egg Five times larger than your standard Kinder Egg, these special edition chocolate eggs are more than just a mouthful, offering over 100g of delicious chocolate to feast one. The famous Kinder chocolate we know and love can be enjoyed again with these Kinder Surprise DC Super Maxi eggs. A gorgeous outer shell of smooth milk chocolate gives way to a sweet white chocolate layer around the inside of the egg, playing home to one of these awesome DC superhero toys within. So go one better than a standard supermarket Easter egg and pick up one of these awesome Kinder Surprise Maxi eggs. Available in two exciting editions, these awesome eggs are perfect for your little one this Easter. When your little man opens up his delicious Kinder egg, he’ll be met by one of the famed members of the Justice League. It could be The Flash – the fastest man alive – a man faster than anything in the world, except your child’s ability to eat his Kinder egg! Or, it could be the caped crusader himself, the Batman! Taking a break from defending the streets of Gotham, Batman has been hanging out in a few of these amazing Kinder Eggs and is just waiting to meet his new sidekick. Finally, and arguably most excitingly, your little guy could be opening up his Kinder egg to meet Superman! The most famous superhero of all time, the Man of Steel loves his Kinder chocolate and has somehow found himself trapped inside one of these awesome eggs. Why not let your boy free him from his chocolate egg of solitude and join him in his quest to save the world? Don’t let the boys have all the fun, this Kinder Egg contains one of four fabulous female superheroes! With Wonder Woman, Catwoman and Supergirl part of the range, your little girl can become the ultimate crime-fighting starlet, keeping the streets of the DC Universe safe. 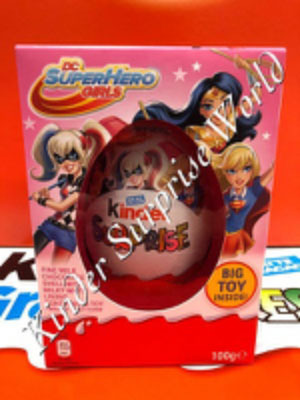 These amazing Kinder eggs for girls can also be hiding a bit of mischief, with notorious bad girl Harley Quinn known to hang out inside the delicious chocolate from time to time. Whichever of these amazing superheroes are hiding inside your Kinder Surprise DC Superhero Girls Maxi, you’ll be sure to see your little girl’s face light up with delight at both the chocolate and the surprise. With a selection for both boys and girls, there really is no excuse not to spoil your little one this Easter and give them more than just an Easter egg. 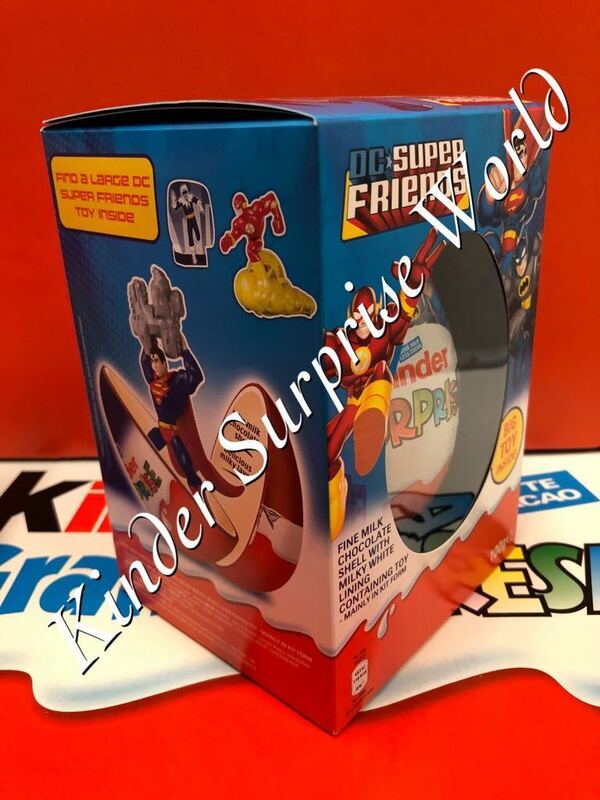 So, act fast and buy your limited edition Kinder Surprise DC Super Maxi egg now at Kinder Surprise World!